“I have had three vertabrae fractures in the last two years. I’m still in considerable pain and cannot do the simplest of tasks. Vacuuming, window cleaning or anything to do with lifting, even a casserole dish, brings on severe pain. I went a whole year in severe pain, could not do much, struggled at work. . . . I could not open heavy doors, open filing cabinets, open car doors, etc., but tried to continue working. I’m part time, so on days off, I just collapsed and rested. It totally changes your life, and I don’t think people really understand it. . . . I’m only 58 but feel like a very very old lady” (from the community forums of theNational Osteoporosis Foundation). Osteoporosis causes bones to gradually thin and weaken, leaving them susceptible to fractures. In the United States, the condition causes about 2 million fractures each year (figures from the National Osteoporosis Foundation). Although the condition affects all bones, those in the spine, hip and wrist are most vulnerable. Many osteoporosis fractures—about 300,000 every year—are hip fractures, which, in the elderly, can be particularly dangerous because immobility during the healing process can lead to blood clots or pneumonia, both of which can be fatal. In addition, 1 in 4 hip-fracture patients over 50 die within a year after the fracture, often from related complications such as a pulmonary embolism or pneumonia. Plus, 1 in 5 of those who could care for themselves prior to the broken bone requires nursing home care afterward. Only one-third of patients with hip fractures return to their previous levels of functioning. Women are more susceptible than men. 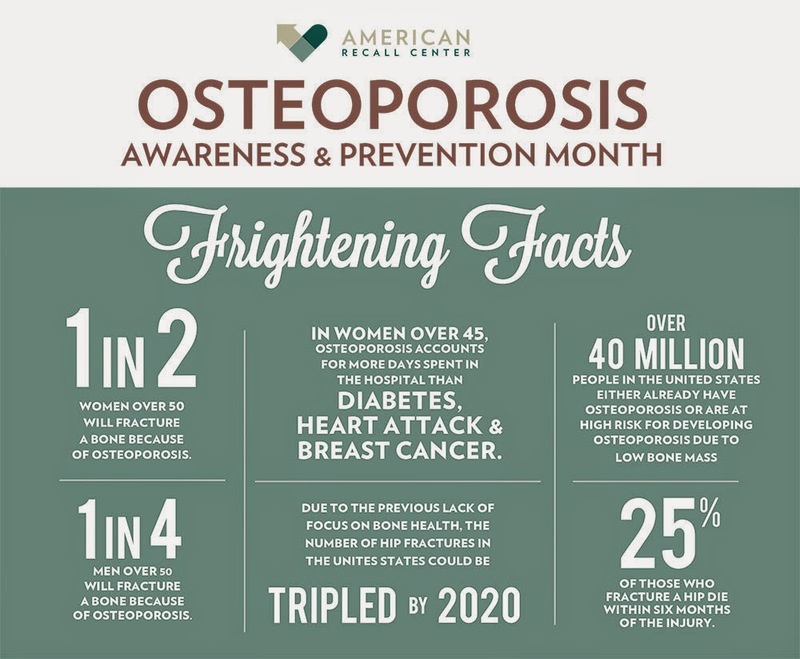 Of the estimated 10 million Americans with osteoporosis, about 8 million are women. Approximately 1 in 2 women over age 50 will break a bone because of osteoporosis. A woman’s risk of breaking a hip is equal to her combined risk of breast, uterine and ovarian cancer. Women are more vulnerable to osteoporosis because they have smaller, thinner bones than men and because the estrogen hormone decreases sharply when women reach menopause, which can cause bone loss. Women who are at higher risk for developing bone loss are thin or have a small frame, smoke, drink more than moderately, live a sedentary lifestyle, have a family history of hip fracture, have had their ovaries removed and are Caucasian or Asian. Although women are more susceptible, men are not immune to the condition. Up to 1 in 4 men over age 50 will break a bone due to osteoporosis. In fact, men older than 50 are more likely to break a bone due to osteoporosis than they are to get prostate cancer. Each year, roughly 80,000 men will break a hip. As a result of problems related to the break, men are more likely than women to die within a year after breaking a hip. Many of the factors that put women at risk for osteoporosis apply to men, as well as low testosterone levels. Although the exact cause of osteoporosis is unknown, the process starts early in life when bone is continuously replaced. Bone loss—where bone breaks down faster than it builds up—usually begins somewhere in your mid-30s. When bones begin to lose calcium—the mineral that makes them hard—faster than they can replace it, the bones begin to thin. For women, bone density loss speeds up during the first five to seven years after menopause, caused by a sharp decline in the body’s production of estrogen, which scientists believe helps keep calcium in the bones. The good news is that the right diet, exercise, supplements or medication can help prevent osteoporosis or lessen its effects. If you haven’t yet been diagnosed with osteoporosis, have your doctor order a bone density test, which shows the amount of bone in the hip, spine or other bones. Doctors routinely recommend this test for men age 50 and older and postmenopausal women. The two most important nutrients for bone health are calcium and vitamin D (National Osteoporosis Foundation). Each day, we lose calcium through our skin, nails, hair, sweat, urine and feces, but our bodies cannot produce new calcium. When we don’t get enough calcium for our body’s needs, our bones must provide it, leading to low bone density and even broken bones. To maintain healthy bones, experts recommend limiting the intake of sodium and alcohol, or avoiding them all together. The best foods for vitamin D are fatty fish such as salmon, mackerel, tuna and sardines. Calcium and vitamin D are sometimes added to juices, breakfast foods, soy milk, rice milk, cereals, snacks and breads. If you’re not getting enough calcium and vitamin D from food, you can take supplements. In particular, it’s difficult to get enough vitamin D without using supplements (see sidebar). Exercise not only prevents osteoporosis by strengthening bones but can also help maintain bone mass if you already have osteoporosis. Through exercise, you build and maintain your bones’ thickness (bone mass density). Before beginning any exercise program, talk to your doctor. This is especially important if you know you have bone loss or osteoporosis. Weight-bearing: Exercises that support your body’s weight include walking, hiking, dancing and stair climbing. Walking as little as three to five miles a week can help build bone health. Resistance: Working against the weight of another object strengthens muscle and builds bone. This type of exercise includes free weights or weight machines, resistance tubing and water exercises. For best results, do resistance exercises two or three times a week. You can make the exercise more challenging by gradually adding weight or repetitions. Work different muscle groups, including arms, chest, shoulders, legs, stomach, and back, but allow for recovery by avoiding resistance training on the same muscle group two days in a row. Flexibility: Having flexible joints helps prevent injury. To flex joints and elongate muscles, stretch regularly or do t’ai chi or yoga. Although estrogen was once considered the standard osteoporosis treatment for postmenopausal women, new options are now available for men and women who are wary of estrogen’s risks, such as breast cancer. Most osteoporosis medications slow down the rate at which the body reabsorbs bone, and one drug can help the body make new bone (from University of Maryland Medical Center). Your doctor can advise you about which of the following medications may be right for you. Bisphosphonates, including alendronate (Fosamax), ibandronate (Boniva), risedronate (Actonel) and zoledronic acid (Reclast), are a class of drugs that has been shown to boost bone density, slow or stop bone loss and reduce the risk of fractures. Patients must take medications first thing in the morning before eating and stand upright for at least 30 minutes. The exception is Reclast, which patients receive intravenously (IV) once a year. Raloxifene (Evista) has estrogen-like effects on bone (prevents bone loss) but does not increase the risk for breast cancer. Calcitonin (Miacalcin) does not improve bone density as well as the bisphosphonates do, but it does slow bone loss, reduce spinal fractures and ease pain associated with bone fractures. This option is an alternative for women who cannot take estrogen or bisphosphonates. Parathyroid hormone (Forteo), an injectable medication, can increase bone production when used in low doses. Bone Up on Facts about Osteoporosis was featured in the June 2014 edition of Senior Spirit.